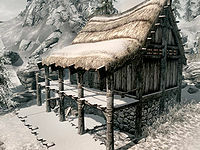 The Mortar and Pestle is the alchemy shop in Dawnstar, located between Brina's House and Beitild's House. It is run by the elderly Frida who also lives above the main trading room. It consists of one area, The Mortar and Pestle. NOTE: Like all other stores, The Mortar and Pestle has a number of fixed wares on display scattered around the main trading room. These can be bought from the proprietor Frida and will disappear from the room when purchased. For a list of these special items, see this section. The main trading room is dimly lit and Frida can be found behind the counter every day between 8am and 8pm. Without the displayed merchandise, a lot of beverages reveal themselves. On the shelves of a non-respawning cupboard behind the counter are three bottles of alto wine and four bottles of wine along with seven bottles of Nord mead. Atop the counter are three bottles of alto wine and two bottles of wine. Underneath the counter are four additional bottles of wine, a single bottle of alto wine, and a potion of resist shock. There is also a small hidden coin purse, two non-respawning sacks with food, and a copy of the Conjuration skill book 2920, Hearth Fire, v9. Above the shop counter are two garlic braids, some dried frost mirriam, and two bunches of dried elves ear, as well as three rabbits. Along the wall next to the cupboard sits a drum, a non-respawning chest, and a respawning meat barrel. Underneath the stairs leading to the second floor is an alchemy lab and a respawning food barrel. 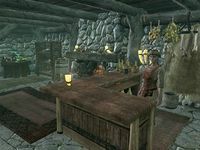 Frida sleeps in her owned bed on the second floor, where even more beverages sit on some shelves next to a respawning food barrel in the northeastern corner: six bottles of wine and two bottles of alto wine. A dinner table is set with two wedges of goat cheese and one eidar cheese wedge, with two loaves of bread on the side. There is also a chicken's egg and two bottles of alto wine. A non-respawning dresser in the corner holds clothes and on its top sit a few spare ingredients: one nirnroot, one creep cluster, one deathbell, and one sample each of frost salts, fire salts, ectoplasm and bone meal. On the other side of the bed are five gold coins on a table and a non-respawning unlocked chest. The following items are sitting out in the store on counters, shelves, or tables. They can be purchased or taken for free if your Disposition with Frida is high enough. They respawn after ten days. The front door has an adept lock, the key to which is carried by Frida. The store may be locked during normal business hours and open in the middle of the night when merchant services are unavailable. Successful workarounds may be to fast-travel out of the city and return after some time, waiting for long periods of time (potentially many days) in order for the store's hours to reset, or breaking into the shop during normal business hours.